“In New England it is everywhere the commonest of the [skippers]....” wrote Scudder over a century ago (1889:1688). It remains our most common native skipper today, although not reaching the abundance levels of Cabbage White or Pearl Crescent. Peck’s Skipper was named by the well-known British entomologist William Kirby for William Dandridge Peck, the first professor of natural history at Harvard. Kirby was working from a specimen from an unknown North American location, which is now probably lost. Another European entomologist, Cramer, named it Polites cora, from a specimen which is also now probably lost (Miller and Brown 1981: 37). Thaddeus W. Harris at Harvard had local specimens of Peck’s; three, dated Aug. 30, 1823, are in his collection at the MCZ (Index; 1862: 316, Fig 139). He also had a particularly small specimen, which he thought might be a different species; he named that Hesperia wamsutta, in honor of Wamsutta, the oldest son of the sachem Massasoit (1862: 318, Fig.141). But Scudder (1862) makes clear that this specimen is identical to a Peck’s, and is not a separate species. From the 1600s through the 1800s Peck’s, like other upland grass skippers, no doubt benefited from the land clearing as European settlers developed an agricultural economy (Table 1). By 1900, Peck's was distributed “from the White Mountains to the sea-coast.” The butterfly was “found everywhere in the open country, especially in meadows, by roadsides, along pathways and in all old forest openings; it is very fond of flowers ---white clover, mint, golden rods, etc.” (Scudder 1862: 174; 1889: 1686, 1688). F. H. Sprague's earliest specimens from Wollaston in the Boston area were from 1878 and 1879; subsequently he found specimens in Malden (1883, 1885), Amherst (1886), Belchertown (1885), and Montague (1885) (specimens in MCZ), thus documenting Peck's Skipper for the Connecticut River valley as well as the eastern part of the state. Farquhar (1934) similarly terms Peck's Skipper “abundant everywhere,” and does not bother to list any specimens or locations. However, there are early 20th century specimens from Tyngsboro (1918), Weston (1921) (MCZ) and Milton (1918 and 1919) (Yale), and many Massachusetts specimens from later years. Jones and Kimball (1943) found Peck's Skipper "irregularly abundant" on Martha's Vineyard (one 1930 specimen is in the MCZ), and "well distributed" on Nantucket (specimens are in the Maria Mitchell Museum on the island). By the 1970's there are MCZ specimens from Berkshire County: Becket, 1972, W. D. Winter, and Lee October Mountain, 1973, S. A. Hessel. In 1971 C. T. Parsons collected it from Nashawena Island in the Elizabeth Islands off Cape Cod (MCZ). In 1982 S. D. Coe collected it in Heath in Franklin County (Yale). Peck’s has a large but northerly range, flying in most of northern and central United States, and in Canada from the east to the west coasts, and quite far north (Layberry 1998). It flies throughout Vermont, and has even been found recently in a few townships in northern Maine, where it had not been known until the recent Maine Butterfly Survey (MBC 2011; VBS 2011; BAMONA 2010). However, it does not have a southeastern coastal range, and is found south of Pennsylvania only in the mountains. Peck’s Skipper’s original native host grass here may have been rice cutgrass (Leersia oryzoides), which it still uses (Scott 1986), and possibly also floodplain cutgrass (Leersia virginica), both of which are native to and found in nearly all Massachusetts counties today (Sorrie and Somers 1999; Magee and Ahles 1999). It also uses the native little bluestem (Schizachryrium scoparius); volunteers for the 1990-95 Connecticut Atlas observed it ovipositing on that grass in the wild. But at some point Peck’s Skipper also adopted Kentucky bluegrass (Poa pratensis), that very common constituent of lawns and meadows today, and that is surely one of the keys to the skipper’s abundance. The Connecticut Atlas reports it ovipositing on Kentucky bluegrass in the wild, as well as on little bluestem. Kentucky bluegrass in our area was introduced from Europe (Sorrie and Somers 1999), but it was also probably native in Canada and along the northern boundary of the United States (Gleason and Cronquist 1991). Thus, this grass could have been used natively in some part of Peck’s Skipper’s range (as is probably also the case with Long Dash), but in Massachusetts it is most likely that Peck’s massively adopted Kentucky bluegrass when it was widely introduced for pasturage in the 1700s. Peck’s is therefore listed among the Switchers (Table 3), butterfly species which have adopted new non-native hosts. Peck’s inhabits a wide range of open meadow habitats, from wet to dry, and seems to thrive in areas that have been disturbed in the past. 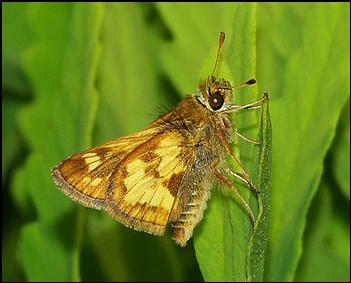 In our area it is the grass skipper most likely to be found in urban and suburban parks, roadsides, and backyards. It is an avid nectarer on flowers. Both MBC (2000-2007) and Atlas (1986-90) records rank Peck’s Skipper as Common, even nearing Abundant (Table 5). It is our most common native grass skipper; the next most common native grass skippers are the Least Skipper and the Dun Skipper. (Peck's is generally of the same relative abundance as the forb-feeding Silver-spotted Skipper.) For the period represented in MBC records, the introduced European Skipper surpassed Peck’s in relative abundance, but that may change, as European is showing a sharp decline from its highs in 1996, 1997 and 2003. There is a slight downward trend to be seen in the two-year moving average of MBC yearly sightings per total trips (Chart 92). However, analysis of nearly the same data using list-length methodology found a small but statistically significant 23.8% increase in Peck's Skipper 1992-2010 (Breed et al. 2012). Peck’s Skipper is not usually found in enormous aggregations, as has sometimes been the case with European Skipper. The highest estimates for a town or conservation area range between 40 and 60; typical cases might be 58 at Sharon Moose Hill Farm TTOR 6/8/2008 E. Nielsen, or 27 at Chelmsford power line, 5/19/2012, B. Bowker and L. Stillwell, or 47 at Ashfield Bullitt Res. TTOR 7/6/2012, T. Gagnon, J. Richburg et al. Illustrating its tolerance for urban conditions, there are many records of Peck’s from within the city of Boston, including from Arnold Arboretum, Boston Nature Center, and Roxbury Millennium Park, and a record from Cambridge (Alewife Reservation 9/18/2009 F. Bouchard). According to MBC 1993-2008 records, Peck’s Skipper flies from the third week in May through the end of October (http://www.naba.org/chapters/nabambc/flight-dates-chart.asp). Two broods are quite evident in the data. Earliest sightings: In the 23 years of BOM-MBC data 1991-2013, the five earliest "first sightings" are 4/30/2012, Chelmsford power line, B. Bowker; 5/13/2009 Sherborn power line, B. Bowker; 5/13/1995 Martha’s Vineyard, A. Keith; 5/15/2010 East Longmeadow, K. Parker; and 5/17/2002 West Tisbury, M. Pelikan. The influence of the very warm springs of 2012 and 2010 can be seen. In only three of the 23 years has the "first sighting" been prior to May 15. In ten of the years the "first sighting" has come in the third week of May (5/15-22), and in ten of the years it has been in the last week of May 5/23-31). A century ago Scudder provided a detailed life history of Peck’s Skipper, writing that “In the southern half of New England, where the species is double-brooded, the earliest generation of butterflies appears upon the wing during the last week of May ---at the beginning of the week near the southern seacoast, toward its middle or end further north...” (1889: 1688; emphasis added). BOM-MBC records suggest that there has been some advance in the average time at which Peck’s Skipper emerges in the spring, compared to the late 19th century. Latest sightings: In the same 23 years, the six latest "last sightings" are 10/26/1995 Sudbury, T. Dodd; 10/19/2013 Newbury, S. Stichter; 10/18/2012 Dover Elm Bank, B. Bowker; 10/14/2004 Northampton Florence T. Gagnon; 10/12/2006 Groveland, M. Arey; and 10/11/2010 Amherst, J. Rose. Scudder gives dates for both broods in our area, concluding that the second brood remained on the wing” nearly or quite to the end of September” (1889: 1688). BOM-MBC records strongly suggest a lengthening of the flight period at its end as well as its beginning, because in 17 of the 23 years under review, the last sightings have been in October, rather than September. Peck’s Skipper is reported by most sources to have two broods in Massachusetts, and the MBC flight chart indicates two maxima, roughly May-June, and August, with sightings tapering off in September and October. Still, the question of broods needs to be more fully investigated, since a partial third brood in September-October has been reported in both North Carolina and in the New York City area (Cech 2005 and sources therein). One response to climate warming in Massachusetts could be initiation of a partial third brood. Peck’s does not have a southeastern coastal range, which should alert us to the possibility of some adverse effects from climate warming (Table 6 ). However, a small range contraction northward would probably not affect Massachusetts much. Peck’s may already have expanded northward into northern Maine within the last 30 years. In addition, Peck’s is adaptable as to host plant, habitat, and broods. It already has two broods, and has remained very common here for over a century. A partial third brood should be watched for. This skipper's NatureServe status in Massachusetts and surrounding states is S5, or secure.